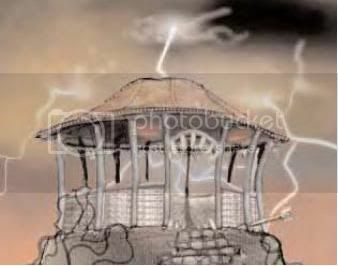 Dread Gazebo... look it up. Today we'll be discussing the single most threatening core aspect of D&D: talking. It's an interesting concept when you give it more than a second thought. D&D is founded on talking. Everything about D&D is verbal communication. You can get rid of the miniatures and grid and still play D&D (1st and 2nd edition players know what I'm talking about since imagination used to be a bigger focus and minis and grids are a newer concept). You can get rid of the dice because it's just a method of creating chance (a coin or any other object technically works even if it's less exciting). You can get rid of the books (several groups don't even play with official D&D rules). You can literally just have a room of a few gamers and still play D&D because the only tool necessary is the ability to communicate. It's not a very good business model that's for sure. So what do I mean by threatening? Well, humans are social animals by nature. We seek human interaction but we're also incredibly terrible at it. We increasingly have things stacked onto behavior with laws, culture, morals, religion, societal norms, personal preferences, biases, peer pressure, fear, ideologies, social identities, conventional standards, personal problems, feelings, emotions, and the list just keeps on going. We have weaved such a delicate maze of non-univesral rules for ourselves and have such limited ability to express ourselves in a way that others can automatically understand clearly that we're utterly terrible at communicating with one another. Communication is a two-way street. One person can say something and another can misunderstand them. You can attempt to pay someone a compliment and another person can take it as rude or be confused as to how they should feel about what's been stated. The person attempting to say something might not even be able to express themselves in the way they're attempting and can come off as odd or ignorant when they might otherwise be a bright individual. To make matters worse, D&D is constantly having to contend with players leaving to play video games for the very reason that talking is the core game mechanic. Let's break these facts down shall we? -You have to describe what your character is doing. -The entire game is comprised of actions and reactions via verbal communication between players and the DM as each attempts to describe, in turn, what is occurring in the game. -Using keyboards/controllers will show what your character is doing. -The entire game is comprised of actions and reactions via the control scheme between the players and the video game as it visually represents, simultaneously to all players, what is occurring in the game. You can play an entire video game in silence and still play through a compelling experience. It sounds like a no-brainer but it's kind of amazing when you think about it. Books and Movies can generate this experience as well but Video Games have come the closest to creating a dynamic, interactive experience (which is what D&D is) and Books and Movies aren't capable of this feat. Games are increasingly trying to offer players more choices and options to the point that two different players can play the same game and have an entirely different experience. As crazy as it sounds, once game designers have the right techniques under their belt and the right tools at their disposal, we'll probably see "D&D the Video Game". So why is talking such a problem for D&D? Well for one, D&D's core experience is its own worst enemy. D&D can be broken down into three core aspects: gameplay, social, and roleplaying. -The very core of dice rolling and choosing what your character is doing is the "gameplay". Another way to think of it is anything relating to the actual rulebooks and products of the game that change how you play D&D. -Some people play to spend time with friends and hang out. That's the "social" aspect. Another way to think of it is simply the way you would naturally act around your friends or in public. -Anything from an elaborate description of a room, to exploration, to two characters talking to one another in the game, etc. is the "roleplaying" aspect. Another way to think of it is this is the character itself talking or doing something that you can't in the real world that isn't dictated by the rules of the game. Gameplay - If you want to explain what your character is doing (such as casting a spell). Social - If you're talking about something interesting (maybe talking about Borderlands 2). Roleplaying - If you want to actually roleplay your character ("Good morrow to you stranger."). It gets even more complicated. Whereas a video game can take everyone's input (button presses) simultaneously and give them an exact output (what you see on the screen) simultaneously as well, D&D can't do that. Players have to listen to each other and the DM and vice versa to know what is going on at any given moment. The players have to take turns giving their input and the output is going to be different for everyone at the table (thanks to their imagination and how they interpret what's going on). To make this even crazier, most groups prefer to have some mixture of the three things mentioned. Most groups like to play the game, hang out, and roleplay (to varying degrees for each). Due to the fact that all three require talking, you can only choose to do one at a time. You can't do them simultaneously. This is simply a fact we have to come to grips with. Video games on the other hand allow the player to control their character while talking simultaneously. For example, in World of Warcraft, all of this can occur at the exact same time: you can have a full conversation with your friends or leaguemates via voice chat while moving your character around. Not only that, you can move your character and attack at the same time. Not only that, your friend can be moving and drinking a potion while you're attacking. Not only that but the other NPCs are moving and firing arrows at you at the exact same time you're doing all of the previously mentioned things. To top it off, all of this is being seen by each player on the screen at the same time. Your character actions are independent of your ability to communicate and this allows for a variety of simultaneous actions. It's astounding how simple it is for a game and yet impossible for D&D to do the same. Try to imagine that World of Warcraft example in D&D terms. You can't even move, slash an enemy, or talk at the same time in or out-of-game. You would do them in steps. It would play out like this with each comma being a separate action (which of course means this next section is going to be grammatically incorrect): You declare to everyone that you're taking a move action and move your miniature on the grid, then you declare your attack against a target, roll your dice, add your modifiers, you state what your total is, you might have your character say something in-game, "Where did these things come from? ", another player might respond in-game or out-of-game, the DM lets you know if it hits or misses, if it hits you roll your damage, the DM marks the damage for the enemy's HP, then the next player takes their turn, takes a move action, then another action to use a consumable, then he makes a remark in-game, "That was a close one. ", then he makes a comment out-of-game that this was the second time in the campaign he's almost been killed, everyone laughs, then someone points out that he wouldn't die so often if he'd stop being so reckless, he agrees to stop being reckless but only because the healer isn't doing their job, the DM patiently waits for a bit (about five minutes), then she decides to finally break it up and get them back on track, then the DM tells you that arrows were fired at you and from where, she rolls, checks your AC, it hits, she rolls for damage, and so on. It's the exact same example but one game has to break down all of those actions down into parts and those actions are done verbally which means you have to complete an action by saying what you're doing before you can talk as your character or to your friends to goof off. I think we take this for granted honestly. Some games have even developed roleplaying techniques as game mechanics so that you can roleplay and chat out-of-game at the same time as well. Even World of Warcraft has the most basic version of this with emotes. That's not even considering other titles out there in regards to roleplaying features. D&D on the other hand will always be stuck with you choosing to use your speech at any given moment to roleplay or to socialize. So what was the point of this long and borderline insane ramble? What's the tip or lesson to take from all of this? Just be more aware of it. Just be aware that out there, there is someone desperately trying to communicate with you and you have to do everything in your power to understand them even if they aren't making any sense. Help them so you can understand them rather than discarding their opinions or thoughts. If they feel that their message isn't being understood then it probably isn't. Be aware that D&D has a system that can't handle certain actions happening at the same time which makes it a slower system that needs to be treated with more care and focus than you might be used to. Be aware that everyone at the table is equally important and they're all just trying to speak but all of the rules mentioned earlier just make that exact process more complex than a Rubik's cube. Most importantly of all, be aware that sometimes you really aren't recognizing that the DM is telling you that the thing in front of you is a gazebo and it's not actually something you need to attack. Communication is key. 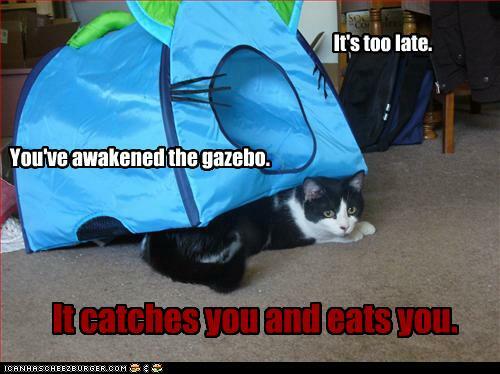 This is Kylak signing out so I can eat the gazebo before it eats me.